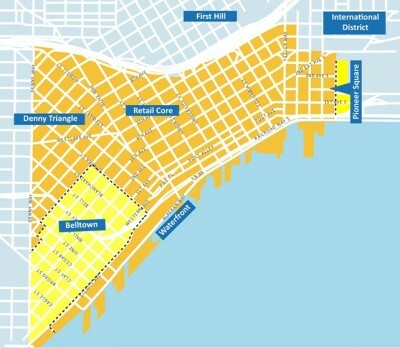 The Seattle City Council yesterday approved the expansion of the Metropolitan Improvement District, the taxing district that funds extra clean-up service and security for a large portion of downtown Seattle, Pioneer Square, the Denny Triangle, and now, Belltown. If you work, live, or otherwise find yourself downtown, you’ve probably encountered folks in yellow jackets cleaning up or otherwise keeping an eye on things. That’s them. What’s new this time is that the taxing district now includes Belltown, the largest of downtown’s area neighborhoods. A fun fact about the MID: they record each instance of “number two” they clean up in the downtown area. This means that someone in their office has a feces-themed map, speckled with dots. Someone needs to do a public records request for that map. I want a copy printed and posted. This is important. Good to “see” you again, Will. And to see you, i.e. last Tuesday.